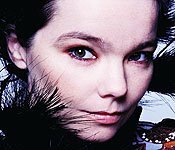 When touring the U.S., Bjork sought to create a "homely atmosphere" in a communal backstage room reserved for artists in her entourage. Well, at least that's what it says in her tour rider, excerpts of which you'll find here. Submitted by Smarg on Thu, 2010-08-12 06:53. Any fool that would pay to see this freak deserves to be nagged by silly riders like this.